Influenza (the flu) can be defined as a contagious respiratory illness caused by influenza viruses. Symptoms can be mild to severe. Complications from the virus may arise, especially in young children, the elderly and those with compromised immune systems. For example, a child with asthma may have serious complications from the flu. The best way to deal with the virus is to be vaccinated. Although the flu vaccination does not fight all strains of the flu outbreak, it fights many. The CDC has declared this year’s flu an epidemic. Concerns regarding the health of babies and children are being taken very seriously. It is important to get your child to a doctor after first symptoms. Symptoms include: fever or feeling feverish/chills, cough, sore throat, runny or stuffy nose, muscle or body aches, headaches, fatigue (tiredness), some people may have vomiting and diarrhea, though this is more common in children than adults. Once your child has been diagnosed with the flu, the doctor will decide the best treatment. Many doctors are prescribing TamiFlu which can drastically reduce the duration of illness and help to minimize symptoms. Don’t forget: It is extremely important that children are seen by a doctor at the onset of symptoms. Without treatment, pneumonia and/or infection may develop. If you suspect your kid has the flu or would like to have your child to be vaccinated to prevent him/her from getting sick this season call us at 248-852-5177. Regal Pediatrics is conveniently located in Rochester Hills near Troy, Sterling Heights and Utica. 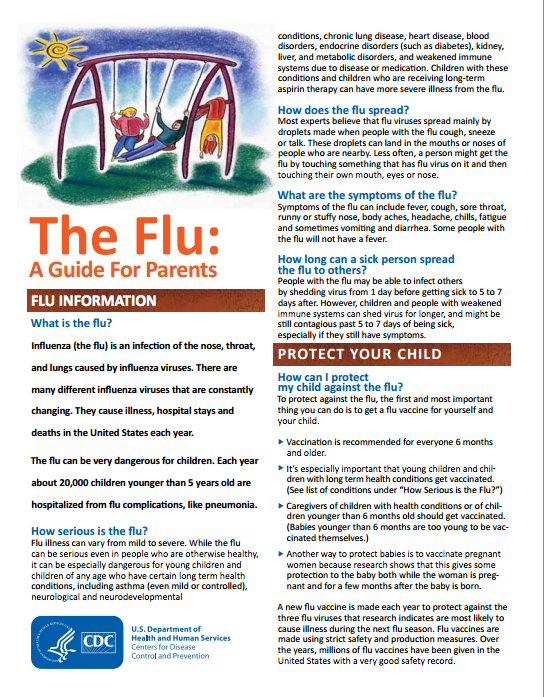 Click here to view the flu guide for parents provided by the CDC. For more information about staying healthy don’t forget to like us on Facebook.